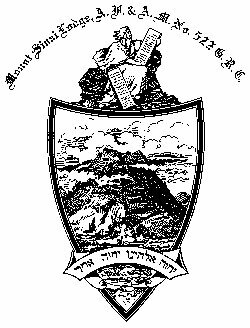 Amalgamation Mount Sinai Lodge – The Lodge of the Pillars No. 522 G.R.C. On behalf of the brethren of Mount Sinai–Pillars Lodge, I thank you, R. W. Bro. Donald A. Campbell for those kind words and to you brethren, for your enthusiastic response of the same. We have spent the better part of a year planning, organizing and preparing for the momentous event which under the direction of our Grand Master, is about to come to fruition in a scant few moments. So how did we get here? The road was not always an easy one. It was fragmented, and filled with obstacles and challenges. But it was also driven my men who were optimistic, persistent and who held a common belief in the synergies attainable by combining our forces. But do not for a minute be lulled into believing that our work here is done. While getting here today was certainly an accomplishment we can all be proud of, it is only just beginning. We have completed the groundwork for a successful union – but it will take the next few months to really become one. I hope that we will learn from each other, take the best practices of each lodge and make them our own, respect our differences and incorporate them into new MSP traditions. It will not be easy, but we will persevere and we will succeed – because it is the right thing to do. It is the Masonic thing to do. I encourage all of you brethren of MSP Lodge, my brethren, to get involved and make your mark on this historic lodge we are building. Your brethren in the future will thank you for it. we so commonly state about Masonry, of making good men better, well into the 22nd century. To once again paraphrase W. Bro. Sydney Thomas Schatzker – “Upon the sturdy historic foundation of Mount Sinai Lodge we have erected the Pillars of the future”. Look well to the future my brethren. It’s a bright and promising one for our Lodge. Finally – I’d like to end with an inspiring quote from a man who moved many people, and inspired great positive social change – and I find it relevant to our situation today. It’s from Martin Luther King Jr. “We may have all come from different ships, but we’re on the same boat now”. History of The Lodge of the Pillars No. 703 G.R.C. During the month of February of each year, it has become a custom in the North American Continent to observe “Brotherhood Week”. This venture is proclaimed from the pulpit and through the means of radio, television, and the press as the only means to world peace and accord. Unfortunately, however, these virtuous proclamation are soon forgotten and less than perfect unity prevails until the following February. A group of Masons led by V. W. Bro. Leo Morse, who were cognizant of the teaching of Masonry, undertook to form a Lodge whose officers and members would be composed equally of Brethren of both the Jewish and Christian Faiths: an unprecedented example of Brotherhood in action. Disregarding sceptics, V. W. Bro. Leo Morse, Rt. Wor. Bro. D. Lou Harris, W. Bro., Donald S. Cody, Bro. Jack Melzerand and others forged ahead with this challenging project. Immerse assistance was rendered by Rt. W. Bro. John Urquhart, D.D.G.M., whose insight and enthusiasm was an inspiration to the committee. V. W. Bro. Hyman Bocknek, in his wisdom, named the Lodge. Symbolically, the Pillars represent the two great religions, Judaism and Christianity. They stand for a united front between Christian and Jew, for strength, courage and determination of man to oppose those demons and bigots who try to separate and divide into different camps the Godly efforts of men of good will. Our ideal being to promote better understanding between Masons, both Christian and Jew, by cooperating and joining socially and fraternally, so that we may gain a better understanding of each other, and be better equipped to carry the torch of Brotherhood far beyond the portals of the Lodge. Bro. Milton Nailberg welded all these ideas into graphic form, and gave us our Lodge emblem, the heart of which is formed by the hands of Brotherhood under the All – Seeing – Eye. The petition to form the Lodge was signed by Thirty-four Brethren and Institution took place on Tuesday March 29th, 1960. The beautiful ceremonies of Consecration, under the auspices of Rt. Wor. Bro. Walter Sills. D.D.G.M., took place on November 9th, 1960, with M. Wor. Bro. Joseph A. Hearn presiding. It was preceded by a banquet and we had the honour of welcoming over two hundred visiting Brethren from far and near. On November 9th, 1960, the Lodge held a special meeting at which all the Lodge regalia was presented by donors. Each was acknowledge and accepted by the charter Master, V. W. Bro. Leo Morse, and the whole of which was then consecrated to the Lodge in the name of the Great Architect by Bro. the Reverend Scott Duncan. December 14th, 1960, was the night of our first installation with V. W. Bro Leo Morse – Master-Elect, Rt. W. Bro. Walter E. Sills, D.D.G.M and Rt. W. Bro. John Urquhart, P.D.D.G.M. – Installing Master. The Lodge initiated its first candidate, Bro. Roy Hornell on Wednesday evening – May 11th, 1960. 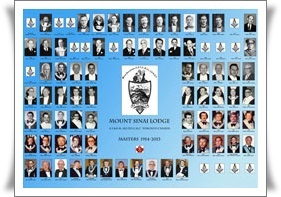 Mount Sinai Lodge owes its conception to Bro. A. Brookstone, a well known member of Alpha Lodge, in which he was initiated as long ago as May, 1900. It had long been his desire to see the formation of such a lodge, and eventually succeeded in interesting several of his brethren of Alfa Lodge in movement. R.W. Bro. Harry Scully, a popular PM of Alpha and a recent D.D.G.M. of District 11, was among the first to offer active assistance, and R.W. Bro. Geo Tait, also a P.D.D.G.M of District 11, another P.M. of Alpha, and W. Bro. W.Porteous, also expressed their willingness to join in the proposal, so that it may fairly be said that Alpha Lodge was the parent of Mount Sinai Lodge. Bro.J.D. Bland, an old friend of Bro. Brookstone, and a life member of Wilson Lodge, also agreed to assist, and on his introduction W. Bro. C.E. Garrad – an English Mason –P.Prov.Gd.Reg.of Essex, England, offered his services as Secretary. A meeting of those interested was then held at Bro. Brookstone’s office on October 27th, 1913, at which W. Bro. Garrard was appointed Secretary (pro.tem) and instructed to prepare the necessary petition to the G.M. for Dispensation. The necessary number of signatures was readily obtained, among them being W. Bro. J.D. Baily, Ashlar lodge, and S. E. Hall – also of Alpha – Bro. A.L Tinker, Wilson Lodge, and Bro. S.Nankin, of Jasper Lodge, Edmonton, Alta. Application in accordance with the Constitution was then made to the Lodge in the District for their consent to the grant of the Dispensation, and it is worthy of mention that the reply of one Lodge only prevented a unanimous consent of all those appealed to, several of the Lodges passing resolutions of very kind welcome to the proposition. These preliminaries having been completed, and R.W. Bro. Scully, R. W. Bro. G. Tait and W. Bro Porteous having been respectively nominated as the first Master and Wardens, the petition was duly forwarded to R. W. Bro. J. Stephens, then D.D.G.M. The Grand. Master having granted the Dispensation, a special meeting was held on Saturday, March 14th, 1914, at the Freemasons’ Hall, College Street, Toronto, to receive it and for the formal opening of the Lodge. R. W. Bro. Stephens, D.D.G.M. occupied the chair and performed the ceremony of inauguration, assisted by W. Charlton. Dir. of Ceremonies, and other distinguished brethren, The Dispensation was read by W. Bro. W. Birell, Dist. Sec., and afterwards delivered to R. W. Bro. H.C. Scully, who named his offices as follows, viz:- R.W. Bro G. Tait, S. W.; W. Bro. W. Porteous, J. W.; W. Bro. C. E. Garrard, Secy. ; Bro. A. Brookstone, S. D.; Bro. J. D. Bland, J. D.; Bro A. L Tinker, S.S.; Bro S. Nankin, L.G. Bro. Jas. Davis, Tyler. It may be a matter of interest to mention that the same of the lodge was suggested by Bro. Brookstone, not alone from its scriptural connection, but as a remembrance of benefits received in Mount Sinai Hospital in New York. The Lodge having been thus established, it was at once seen that a real necessity for it had existed, and application for membership came quickly – 15 being handed in to the Secretary before the close of the inauguration meeting. The first regular meeting of the lodge was held on the site of the proposed new Masonic Hall in Spadina Road, and was honoured by the presence of the M.W. the G.M, W.D. McPherson, and several other distinguished brethren. During the short period remaining before the summer recess 17 candidates were initiated, and at the meeting of Great Lodge held at Niagara in the July following, the Warrant of Constitution of Mount Sinai Lodge No. 522. on the Grand Roll of Canada was formally granted. The consecration and constitution of The Lodge took place on October 16th, 1914, the new D.D.G.M., R.W. Bro. G.H. Smith, being the Consecrating Officer, assisted by the following Grand Officers, viz:- W.Bro. Rev. W.J. Armitage, P.G. Chap. ; R.W. Bro. C. E. Edmunds, Gd. D. of C.; R.W. Bro. E.M. Carleton, Gd. Sec’y., etc, etc. R.W. Bro. Harry C. Scully was again appointed W.M. and invested his officers as above mentioned, with the addition of Bro. A. I. Willinsky, Chap. ; Bro. M.G.DeY, Greenberg, Treas. ; W. Bro. J.D. Bailey, D.of C.; Bro. E.R. Sugarman, J.S. ; Bro. Isadore Feldman, I.G. ; Bro. M.S. Stein, Org. At the regular meeting held on the 12th day of January, 1915, after notice of motion in that behalf had been given, the following members were unanimously elected Honorary Members of the Lodge in appreciation of their efforts in its formations, viz: R.W. Bro. H.C Scully, W.M. ; R.W. Bro. G Tait, S.W. ; W. Bro. W. Porteous, J.W. W. Bro C. E. Gerrard, Sec’y; Bro. A, Brookstone, S.D. ; Bro. J. D. Bland, J. D.; Bro. A. L. Tinker, J.S. and S.Nankin, I.G. Writing at the expiration of the year from the inauguration meeting it may be stated that there is every appearance of a successful future for the Lodge. During the year 27 candidates have been initiated and there are many waiting.